Is Frequency Enough for Decision Makers to Make Decisions? There are many advanced techniques that can efficiently mine frequent itemsets using a minimum support. However, the question that remains unanswered is whether the minimum support can really help decision makers to make decisions. 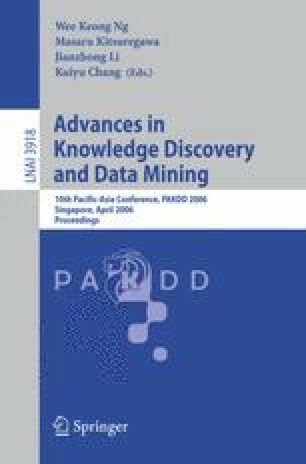 In this paper, we study four summary queries for frequent itemsets mining, namely, 1) finding a support-average of itemsets, 2) finding a support-quantile of itemsets, 3) finding the number of itemsets that greater/less than the support-average, i.e., an approximated distribution of itemsets, and 4) finding the relative frequency of an itemset. With these queries, a decision maker will know whether an itemset in question is greater/less than the support-quantile; the distribution of itemsets; and the frequentness of an itemset. Processing these summary queries is challenging, because the minimum-support constraint cannot be used to prune infrequent itemsets. This research is partially supported by Australian large ARC grants (DP0449535, DP0559536 and DP0667060), a China NSFC major research program (60496327), and a China NSFC grant (60463003).